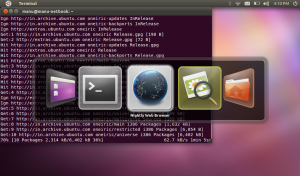 Ubuntu Linux (a GNU/Linux-based computer operating system) version 11.10 has been released and available for download. The new release includes some enhancements to make your experience even more enjoyable. The Default user interface is set to unity shell on top of GNOME 3.x. However, you will get a 2D version of Unity as a fallback for systems that lack the hardware resources for the 3D version. The good news is you will be able to install the entire GNOME 3 desktop along with GNOME Shell directly from the Ubuntu repos.